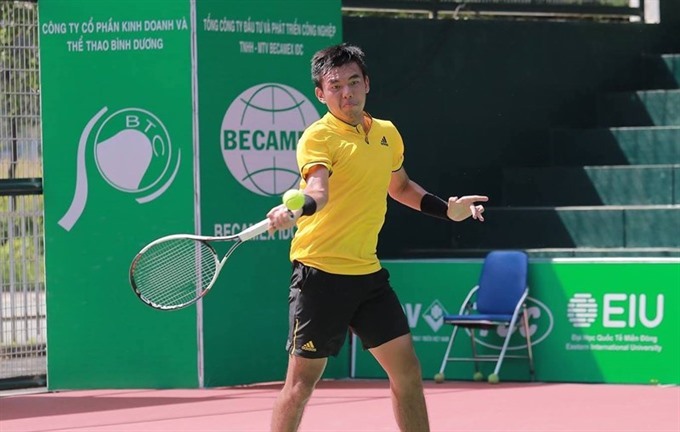 HÀ NỘI — Việt Nam’s Lý Hoàng Nam booked his spot in the quarter-finals of the Việt Nam F3 Futures tennis tournament in the southern province of Bình Dương on Thursday. Nam, world No 522, defeated Lu Tyler of the US, world No 994, 6-4, 6-2 after one hour and 21 minutes in the men’s singles second round. Nam, No 2 seed, will face No 8 seed Arjun Kadhe of India, world No 758, in the next round. In other matches, Andrew Harris of Australia crushed Yuichi Ito of Japan 7-6(2), 6-2. Arjun Kadhe of India beat Arata Onozawa of Japan 7-5, 6-2. While Lawrence Bataljin of Australia lost to Dusty H Boyer of the US 1-6, 2-6.